The Smithsonian’s National Portrait Gallery has appointed Taína Caragol as its curator for Latino art and history. Caragol will be responsible for acquiring artworks for the museum’s permanent collection and is a part of the curatorial team that will produce an upcoming “Portraiture Now” exhibition focused on contemporary portraits by Latino artists slated for 2014. Caragol was most recently a consultant on academic programs for the Museo de Arte de Ponce in Puerto Rico, where she organized a yearlong series of conferences around the painting “The Battle of Treviño” (1878) by Francisco Oller. Previously she was the curator of education for the same museum. She has also worked as a consultant of art and archival collections for Lord Cultural Resources and as the Latin American bibliographer for the Museum of Modern Art Library. Born in Puerto Rico and raised between there and France, Caragol expects to defend her dissertation at the City University of New York in fall 2013. Her dissertation is titled “Boom and Dust: The Rise of Latin American and Latino Art in New York Exhibition Venues and Auction Houses, 1970s–1980s.” She has focused on Latin American art from 1750 to the present for her doctoral degree. She earned her bachelor’s degree in modern languages (French and Italian) at the University of Puerto Rico (2000) and her master’s in French studies from Middlebury College in Vermont (2001). Caragol is co-curator with Johanna Fernandez and Yasmin Ramírez of a forthcoming exhibition for the Bronx Museum of the Arts about the Young Lords—Puerto Rican activists in 1960s New York and Chicago. The National Portrait Gallery has 77 Latinos represented in its collections, including Joan Baez, César Chávez, Miguel Covarrubias, Carolina Herrera and Pedro Martinez. The museum previously presented two exhibitions that focused on Latino portraiture. The first, “Retratos: 2000 Years of Latin American Portraits” was organized by the National Portrait Gallery, the San Antonio Museum of Art and El Museo del Barrio in New York City (2005). Then “Legacy: Spain and the United States in the Age of Independence, 1763-1848,” was presented by the Portrait Gallery and the Smithsonian Latino Center, together with the Sociedad Estatal para la Acción Cultural Exterior and the Fundación Consejo España-Estados Unidos (2007). 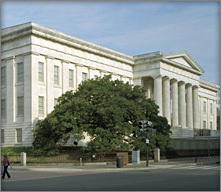 The National Portrait Gallery is part of the Donald W. Reynolds Center for American Art and Portraiture at Eighth and F streets N.W., Washington, D.C. Smithsonian Information: (202) 633-1000. Website: npg.si.edu.